I’ve been using Office 365 a while now. Here are my cool and not-so-cool features. They’re mostly simple things. It’s weird how the simple things make a big difference. Some of these features may already have existed, I just didn’t know about them. Cool Word—how long have I been writing this novel? 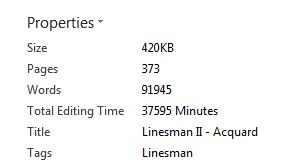 Word tells you how long you have been editing a document. Click on the File tab and you get document information. One of the tags in the Properties area is ‘total editing time’. So far we have spent 37,595 minutes writing our latest novel—626 hours or 26 days straight. That’s a big chunk out of our life. I don’t know how accurate it is for us. When I’m editing I often close the laptop without exiting from the document, but it’s an interesting indicator of how much time we do spend on a book. In the old versions of Word you used to be able to click on the page number at the bottom of the screen and bring up the Go To Page box. Now I have to use <ctrl><g> (<ctrl><g> was always there, I just preferred to click). I like the simple markup option. It shows you a nice clean manuscript, but also indicates where revisions have been made. When you open a document it gives you the option to resume where you last left it. Very nice when you’re in the middle of editing. We often make comments as part of the editing process. It’s great to be able to reply to a comment. The way Microsoft displays the templates on the File > New page has changed. It now shows you a list of templates you can open. Most people will think this is a good thing. Me, I just want all that junk off my front screen. I’d love to be able to add my favourite templates here (normal, manuscript, blog) and get rid of the whole distracting mess of the rest. I don’t use other templates that often, and I’m happy to go look for them when I do. While I’m on it, please, Microsoft, bring back the one-click for a new file based on Normal template. You haven’t had it for a few versions now, but I really miss it. Again, one of those things that should really be an improvement, but Groove, I miss you. I use a laptop and the desktop and write between, depending on whether I am at home or out. I add my continuity notes to OneNote. It used to be that I’d come home, plug the laptop into the network, open OneNote on the desktop and any updates I had made during the day were copied across to the desktop. Remember, too, that throughout the day I don’t have the internet on, because all I am using is the word processor. To share OneNote in Office 365 I had to put the master file on the cloud drive. Now, I come home, plug the laptop into the home network, open OneNote on the laptop so it can copy its data up to the OneNote master, then open OneNote on the desktop so that it can update what has just been uploaded from the laptop. It’s a lot more complex. I think Microsoft needs to go back and redesign Outlook. 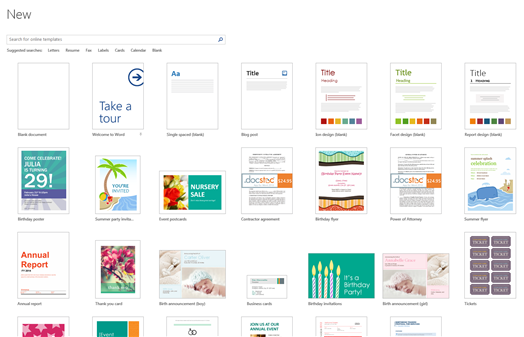 All the good stuff that’s in Office 365 Outlook was already there in Office 2010. It wasn’t broken. They didn’t need to fix it. I particularly hate the wasted space they force onto us by giving us the start of the mail beneath the mail heading. If I wanted a preview, I’d use the reading pane. It’s designed for people reading their email on tablets or phones. Microsoft, I have news for you. Some of us don’t. I’d love an option to condense each mail down to its heading line. They changed the icon from yellow to blue. Half the time I open Outlook when I think I am opening Word. There are some good things and some not-so-good with the new Office. Otherwise, the functionality itself is sound. Microsoft puts out a good product, and so far, it’s still that.